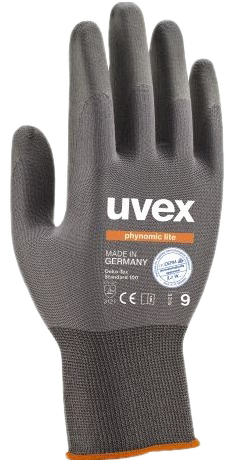 We’ve teamed up with uvex to give away a free pair of uvex phynomic lite safety gloves to the first 10 installers to register their interest in the product. To be in with a chance to receive a pair, simply fill in the enquiry box at the bottom of this page. The uvex phynomic lite is the lightest safety glove in its class. Manufactured in Germany using revolutionary 3D hand forms, the soft, breathable 15-gauge fine-knit liner, mimics the contours and creases of the hand giving a second skin fit for a natural touch. The flexible construction means there is no need for this product to be ‘broken in’. The extremely flexible and breathable aqua-polymer coating is exceptionally durable, provides outstanding grip in dry and slightly damp areas of application and is touch screen compatible. The uvex phynomic lite meets the high uvex pure standard. These safety gloves do not contain substances that are hazardous to health and cause no skin irritations. They are also free from solvents, accelerators and from allergenic substances. The phynomic lite has demonstrated a very good skin tolerability when used as intended and has been dermatologically approved. uvex climazone functions like the body’s own climatic system: deviations from the individual climate are balanced and the body temperature remains at a consistently comfortable level. Excess warmth and moisture are efficiently removed reducing the feeling of cold. Temperature regulation is of particular importance in hand protection products. Hands have more sweat glands than any other part of the human body, with 375 per square centimetre on the palm and 200 per square centimetre on the back. During physical activity, the resulting moisture must either be stored or displaced/redistributed by the material. Innovative coating technologies, leading-edge materials and unique ventilation solutions ensure high product quality and wearer acceptance. The material’s breathability, ventilated design and high moisture retention create real comfort and ensure dry, protected hands. The uvex phynomic lite comes in sizes 5, 6, 7, 8, 9, 10, 11 and 12. Click here for the sizing chart.